= 3 times the love! Did you know that yesterday was Blue Monday? Well, it was. Supposedly, it's the most depressing day of the year. And after the weather we had yesterday, I can see why! So my good friend Liz thought we should use Blue Monday to bring cheer to others so she set up the Blue Monday Challenge. You can read all about it here. The girls and I thought this was a great idea, so we took the challenge head-on. Then we stamped them and sent them out to some of the older people of our church who bring a smile to our faces every Sunday. We thought maybe this would help warm up someone else's cold winter day. But trust me... doing this warmed up our day even more! Thanks for the challenge, Liz! You rock. Yes, with the help of my parents and my brothers' families, we revolted against winter this weekend. We donned our swimsuits in January. We splashed around with our cousins. We braved the waters with Baba. Unfortunately, I don't have a picture of this. But just picture my dad and a timid little Millie walking hand-in-hand through the little pool. She got braver with each step. It was precious. Trust me. We lounged in a hot tub. We stayed in an amazing cabin. And we enjoyed good meals together. without even so much as a scream from any of the 7 children! You can keep your cold, icy, desolate wintery-ness. We're going to have fun anyway. Thanks, Mom and Dad for the fun weekend away! And thanks, Honey Creek, for being so cool. Do you notice a difference in these two pictures? It's desolate. It's sad. I'm pretty sure I can hear the trees sighing under their heavy ice-laden branches. Yes, I will admit that up-close the branches do look pretty amazing, what with their crystal ice casings and all. I really am amazed how God can take something so horrid (a.k.a. winter) and weave beauty through it. For that I am thankful. But I know I'm not the only person around here who is tired of the snow and ice storms. I know because I've read your blogs. I've overheard your conversations in the stores. I've seen you slipping and falling in the parking lots (you didn't think anyone was watching, did you?). So I say we all band together and revolt. I'll let you know as soon as I have a good idea. In the meantime, maybe you can think of one for me. I'm thinking of going into hibernation. That's right. I'm now offering classes. 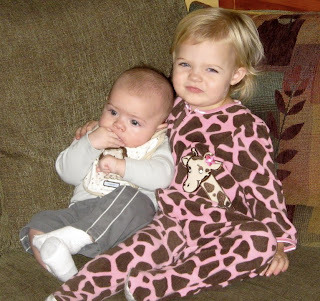 The smart young teen told me she would never have babies, well... at least not for a long, long time! One of her quotes of the day: "How in the world do you do this by yourself all the time?" I didn't have an answer ready for her right then, but after thinking about it, I realize how: "Only by the grace of God." Seriously. I've had many times when I just didn't think I could do it. I just wanted to lie in bed all day and hide under the blankets and ignore my responsibilities. But then I remember Philippians 4:13: "I can do everything through him (Christ) who gives me strength." Even juggle 3 little ones. Oh, and an update on the dairy situation from my last post... I don't think it's a dairy problem after all (Thank goodness, because I was really, really missing my good friends, cheese and ice cream!) And thanks to all of you who gave me some great advice or even just your sympathy. Why this sudden change in diagnosis from his mother, who is completely educated in this area? (please note the sarcasm) Well, I've been googling (of course a very reliable source of information) and have seen over and over again that if babies are lactose intolerant, they have constant diarrhea, but Tate hasn't had that. He's had some runny diapers, but I think it's actually due to teething. Which could also explain the fussiness and drooling and spitting up. Hand always in the mouth. Chews on everything. Wish I could get pictures of the white bumps coming in under his gums, but it makes him too mad. It's just weird to me that they're not the bottom front two, or even the top front two. I'm pretty sure they're the canines! Did any of your babies ever get their canines first? Does this seem odd to you? At least he still has his handsome little smile. Seriously. Most of the foods I eat contain dairy (which could be the cause of my ever-growing "dairy-air"...) Pun intended. So why am I just noticing this dairy-craze I have? Because Tate has become fussy. And spitting up All. The. Time. 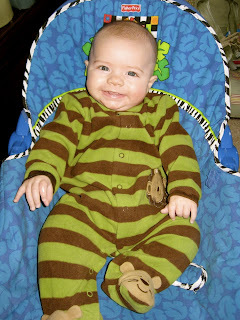 This all just came about around Christmas when he turned 4 months. Before then he was the perfect model of a perfect baby. Happy, giggling, never even needed a burp rag. He's still super sweet and tries to be happy. 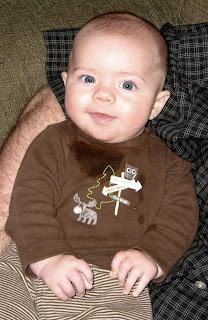 But when he fusses I can tell that he's uncomfortable and the constant spitting-up has been nearly unbearable. So, I thought I would try to give up dairy for a week and see if that helped my little man. But in my giving-up-dairy venture, I've had a few hiccups. For instance, the other night we were out running errands and decided since it was Taco Tuesday, we'd pick up some tacos. And I ordered a burrito with potato oles and chicken. No dairy, right? WRONG! Little did I know that cheese would be dumped over the entire inside of my "milk-free" burrito. Then for breakfast, instead of my usual cereal with milk or a tall glass of chocolate milk, I opted for a banana and toast. Except after the toast entered my mouth I realized that I had slathered BUTTER all over it. But how can I avoid butter? Seriously! Does that really count as a dairy product? But I've been trying hard. Very hard. My favorite snacks include yogurt, cheese, and chips with dip. None of these are acceptable this week. So I ventured out to Target to get a few new snacks - my favorite being Blue Corn Tortilla Chips with salsa verde. And the salsa verde is really spicy, making me drink tons of water, so that's good for the ol' milk supply too! So, I'm trying to decide if I hope this helps Tate or not. I really don't want to have to give up dairy. I heart dairy. But I love my baby more. Much more. And I don't want him to be uncomfortable. So I guess we'll just see where this little experiment leads us. Until then, enjoy this sweet little picture of my handsome little man, taken by my 4-year old on her new Hello Kitty camera. Question for ya... have you ever been stood up? You know, you make a date with someone... maybe one of your girlfriends, or maybe a boy... and you pick out just the right outfit, pretty up your face with just the right blend of makeup and ready yourself for a fun time out with a friend? Then you wait by your door or show up at your designated meeting spot and wait and wait and wait. No one shows up. You start to think, "Hmmm... they must be in a traffic jam or something because I'm sure they wouldn't just forget about our date..." But as the minutes roll by, you realize that in this day of cellphones and texting, there's really no reason why they couldn't have contacted you by now. Only then you realize... you have been STOOD UP. Well, that's exactly what YOU did to me and two of my youth sponsor friends Saturday night! Yes, you stood us up! We got all dolled up, made babysitting arrangements and showed up at the mall only to wait by the fireplace for 30 minutes with no sign of you in sight! I think I can understand though. 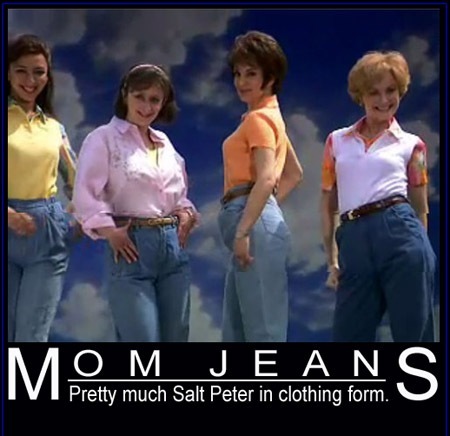 Were you afraid we would show up in our mom jeans and mall bangs and embarrass you in front of all your friends like these ladies? and ask you to watch them while we "ran some errands?" But in reality, we showed up looking HOT. Like head-turning hot. I wish we would've taken a picture of us 30-somethings (and almost 30-something), but since we didn't I found a picture that is pretty close. I mean, we looked so good that I swear we saw several other highschool mall girls looking at us longingly thinking, "If only we could hang out with cool moms like that. I wish we had such awesome youth sponsors that cared about us as much as those fashionistas care about their youth girls. sigh." But honestly, we're not all that bitter. 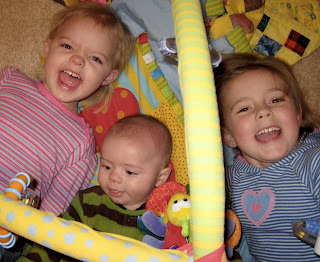 Believe it or not, as much as we missed you, old mamas like us still know how to have fun even without you young'uns. I even scored a smashing pair of purple faux-croc sling-back heels for only $5! Pretty sure I won the contest we were having on finding the best $5 deal - which you could've been a part of if you would have shown up. You missed out on an amazing prize from Amy. But you wouldn't know... since obviously you weren't there. Okay, so I'm being a little harsh, I know. Especially since several of you did have actual excuses - like cheerleading, family plans, yadda, yadda, yadda. But it's only because we missed you. We really do enjoy spending time with you. Even if you do embarrass us. Okay, I'm finally doing it. My blog friend Sara at This Heavenly Life has been challenging her readers to link up to her on Thursdays for "What We Found at the Library." However, this time she's blogging about what books they got for Christmas. Since we got so many great books for Christmas, I thought I'd link up with her today. Of course we had to get this book for our little Millie, especially since Addie has a couple of books about Adeline. 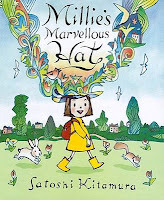 It's beautifully illustrated and is a quaint little story about a girl, named Millie of course, who has a wonderful imagination and inspires others around her to use their imaginations as well. Millie LOVES having this read to her! Okay, so this book doesn't really have an author, so there's really not much of a story, but this little gem from my parents has been a big hit. They put a picture of Millie on the back page so it shows up throughout the entire book with her in different outfits. Very cute. You really can't go wrong with these classics. My in-laws got a few of these books for Addie earlier this year and she was able to sound out the words and actually read them! We only had a few little ones, so for Christmas they got her some big ones full of stories that she can use to tackle reading. We use these for our "pre-school" time and I really like them because they introduce just a few new "sight" words at a time (that are hard to sound out) and use repetition to help the kids remember them. This series was one of my favorites when I was little. I loved how extreme the characters were, but were still so lovable. 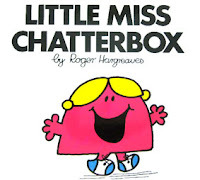 We got these for our own little miss "chatterbox" and miss "shy." Millie likes to tote them around because they're nice and little and Addie has already requested to get the rest of the series. I love reading books to my girls that I remember reading myself. Well, there it is, just a few of new books we've added to our ever-growing collection. Have you gotten any good ones lately? "Hi Katie, this is Kara Hogan, a producer on the Ellen Degeneres Show. We liked your story. Give me a call back as soon as you get this message." Unfortunately, this message was received while we were visiting family up in Michigan . And even more unfortunately, this was back before I had a cell phone that I actually used, so by the time I got the message and called back, it was too late. Humph. What warranted such a call? Well a few weeks before, I had seen that Ellen was having a Worst Vacation Contest, and I was pretty sure I had a good one - especially since it was our honeymoon that was so terrible. Are you ready for a good story? Well, kick your shoes off, put your feet up, sit back and relax, because here comes a doozy. Yes, it was our honeymoon. Now keep in mind that we were married young - barely 21 years old and were both still in college, so of course - no money. My cheap frugal husband had a friend whose family owned a cottage across the street from Lake Huron up in Tawas City, MI, which we could use for free. Okay, I thought, so it's not on the lake, but it's close, so I'm sure it'll be fine. Really, what can go wrong with FREE? After the long drive up to northern Michigan, we finally arrived at our little cabin. From the outside it looked a little old and worn, but that just attributed to its character (I told myself). And we did already know that it wasn't on the lake, but we didn't realize the view of the lake was completely blocked by other houses. But, oh well, not much we could do about that... I was sure the little old cabin would be much nicer inside. I mean, Chad's friend did realize this was for our honeymoon, right? 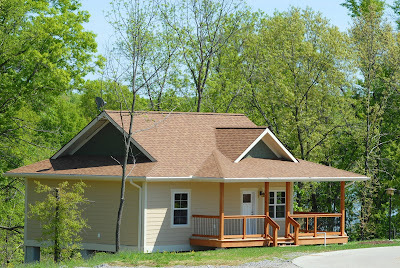 Of course, I had to pee right away, so the first thing I did when we entered the little cabin was head straight for the bathroom. Seconds later, Chad heard me scream and then heard the toilet flush. Not a good combination. As he came running in, he saw me ashen face stammering about the ginormous mouse I saw floating in the toilet. Of course, I thought it was a good idea to flush it, since I wasn't thinking clearly in my state of shock. After a few flushes, it seemed like it was clear and wouldn't plug. Phew. Close call. Then we made our way to the bedroom. One step into the dark room told me that I didn't want to sleep in there. It smelled as musty as my grandmother's closet full of mothballs. I could barely breathe in that room, let alone sleep. Luckily, we'd brought along our brand new air mattress, so we just decided to camp out on the living room floor. Unluckily, our full-sized mattress only came with a very crappy hand pump, so Chad used up most of his energy pumping up the mattress all evening. Finally we were able to cuddle up together and catch some zzzz's. I woke up the next morning to the cheery, beautiful sunshine and made my way to the bathroom. About halfway there I noticed that my feet were wet and were getting wetter with each step. "Hmmm... that's strange... why is there water all... AAAAHHHHH!!! CHAD, there is water ALL OVER the kitchen and bathroom floor!!! What in the world? How could this have happened? Oh, wait, the mouse." Yes, the mouse. The one I decided to flush. The consequence of my great idea was finally rearing it's ugly head. We spent the next several hours mopping up nasty toilet water (and sewage) and then trying to disinfect the whole floor, which seemed unusually expansive for such a small cabin. So, after our cold showers on the first day of our honeymoon, we thought we should head for the beach. Only, we didn't realize that during our cleaning and showering ventures, it had started to rain. And rain it did. All that evening and into the next few days. Leaving us with a broken television and nowhere to go. At least we had each other, although the thought of ice-cold showers kinda put the romance on hold. My dear sweet new husband really wanted us to have fun though, so he got some marshmallows and simulated a fire for us so we could pretend to roast s'mores. Believe it or not, chocolate, marshmallows and graham crackers are a good combination, fire or no fire. Isn't he adorable? Finally, after a few days of cold rain, it let up for our last day in Tawas. The next day we would be heading north to Mackinaw which would HAVE to be much better than this. So for our first sunny day, we went to the beach, although it was still pretty chilly and VERY windy. Did you know that I have hard contacts? Did you also know that wind and sandy beaches and contacts don't mix? I kept getting sand in my eyes, so I thought I should take my contacts out. Trying very hard to shield the wind I got the right one out, but in the process of getting the left one out, the wind picked up and blew it away. Now, if you know anything about hard contacts, you know that they are not disposable and are expensive, so you typically don't have extra lying around. So Chad and I searched and searched the beach for my missing contact. Yes, I'm sure we looked ridiculous, scouring the sandy beach for a teensy-tiny little contact that was obviously hopelessly lost forever. The worst part is that it was the contact for my worst eye. I can see nothing but big fuzzy blobs without that contact. After giving up the search, we called every eye clinic around and none of them carried my prescription for that type of contact. So we called my mom and she overnighted them to us. Only, she would have to send them to the Mackinaw post office since we had no idea where we'd be staying the next night. A great day spent at the beach.... "humph" again. Back at the cabin... at about 4:00 in the morning I was awakened to scratching sounds. "Chad, what is that? Do you hear that?" Chad woke up and confirmed my fear - it was the sound of mice running around in the walls. Now I definitely couldn't go back to sleep and we were going to be leaving later in the morning anyways, so we decided to just get up, even though it was an ungodly hour. However, we did get to see a beautiful sunrise over Lake Huron before heading out, so that brought a smile to our tired faces. Now, just so you're aware... I get carsick very easily and with a long drive to Mackinaw on curvy roads without being able to see barely anything, I was one sick little lady. And being the new wife and all, I really didn't want my groom to see me vomit on our honeymoon, so I tried so hard to keep from puking. I actually did manage to hold it in, but I felt terrible and kept that queasy feeling with me most of the day. Which of course, would be great for the boat-ride to the island later. We spent that night back in Mackinaw City and headed down to Lake Ann Camp near Traverse City the next day (which is where Chad and I first met). We had a good day seeing old friends and had packed our tent so we could camp out that night. Although I didn't realize that the only campground around was a "rustic" one. That meant no bathrooms. Just a filthy port-a-potty. Again, very romantic. But oh well, I thought, this just fits the theme of our honeymoon after all, right? Creepy toilets, no showers and sleeping on the ground. At least I can say, when we finally arrived back at our tiny little apartment the next day, I was sooooo happy to finally be home! So that's it, folks. The Worst Honeymoon Ever. Although it did give us plenty of time to get to know each other and how we function during trials. And it always gives us something to laugh about when we need to cheer each other up. So I guess it wasn't all that bad. At least it was spent with the one I love the most. We always said that since our honeymoon was so bad, we'd go somewhere really nice for our 10-year anniversary, like Paris or an exotic island. Well, this summer will be 10 years and we're not as rich as we thought we'd be by now... ;) And sitters for 3 children aren't always so easy to come by (since grandparents either work or live too far away)... But since we've only ever gone somewhere alone together for three nights total (1 night to Chi-town before kids, when we were living only 3 hours from there, and 1 night on two different occasions to the Amanas since kids), we think it's time for a little getaway. Although now it's looking like maybe a long weekend to somewhere we can drive to. But preferably not in Iowa. Any ideas? Suggestions for a fun, cheap, drive-to-able vacation? Please let me know! I LOVE after Christmas sales. I REALLY love Target's 90% off sale. I really REALLY love getting $200 worth of stuff for $20. I really, really, REALLY love getting my Christmas decorations out the next year and discovering my new treasures! Probably, being it is the 5th of January. However, I've been busy so you'll just have to make room for a few more Christmas images. We started out on Christmas Eve building a snowman. When I say "we," I really mean Chad and the girls. Tate and I were snuggled up inside all cozy and warm. They went with a 2-faced snowman this year. Addie wanted us to be able to see it from inside our house, but we also wanted to make sure it greeted passers-by. Chad was ready for lunch. Woah! Who's that crazy albino lady? 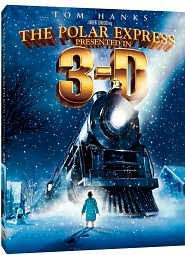 We bought it in 3-D this year, although about half-way through we decided we liked it better in 2-D.
Of course we had to indulge in hot chocolate and popcorn too! Christmas morning, the kids ran downstairs to see what had happened over night. Millie loved her new book! Tate even got a little truck, and looks like he already knows how to play with it. After opening presents, we gathered for our Christmas Morning Monkey Bread (which we made the night before while the hamballs were in the oven). We lit candles and sang Happy Birthday to Jesus. After our family festivities, we looked outside and saw snow and ice covered streets. Hmmm... we thought... probably shouldn't make the 70-mile trek to Nana and Baba's house. We just took it nice and slow and were able to make it there in time for a delicious meal with the whole family. Of course, it was a little loud, what with 7 kids age 4 and under! Unfortunately, all of the pictures of mine and Chad's family celebrations are on our parents' cameras, so you'll just have to put up with videos. Five of the seven gave us our own personal concert. Tate had fun laughing at Nana Lois. Millie and Baba had a ho-down. The day after Christmas, Chad's family traveled all the way from Northern Michigan to stay with us for the week. Tate got a lot of attention, of course! I've had fun reading all of your Christmas posts. Sorry mine was so late in coming! Yes. I'm still alive. Just haven't had time to post anything lately. Hope to post an update soon. Please stop harassing me with prank phone calls and nasty emails. *wink* I know the masses are eagerly awaiting my latest blog post. Please keep thriving and try to wait another day. Or two.